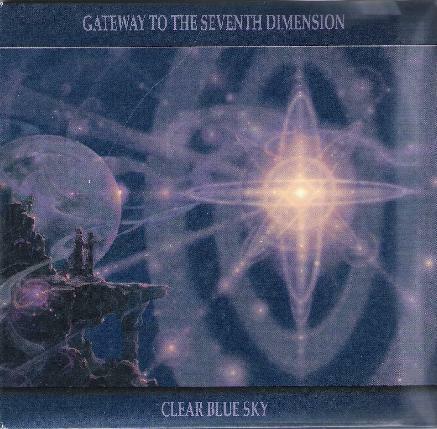 Clear Blue Sky - "Gateway to the Seventh Dimension"
Clear Blue Sky have been active for many years, beginning with a couple albums on the Vertigo label in the early 1970s (the cover of their first album was done by Roger Dean). Their latest album, Gateway to the Seventh Dimension, consists of beautifully composed and executed progressive rock with a hard rocking edge. Guitarist John Simms dominates throughout with stylistically varied playing, tasteful leads and assertive rocking chords. Add to this a prog infused keyboard presence, solid composition and production, a seamless flow from one track to the next, and you've got an impressive hour of music. Among the highlight tracks is "Blue Star of India", a steady paced hard rocker with bits of Blues. Simms' vocals have a Geddy Lee quality to them that goes very nicely with the music. And there's lots of nice jamming that adds intensity to the music. Here and throughout the album Simms rips off some very tasty leads and he can make powerful statements with single wailing notes. "Love Inner Spiritual Awakening" starts off as a beautifully melodic song, but culminates in a wild prog infused hard rocker with more ripping guitar. "The Unseen Place" is a short, intense, spaced out transitional piece that paves the way for "Vision at Chebar", an excellent track that is metallic and spacey, but also aggressive and soothing. Clear Blue Sky really excel at traversing multiple contrasting moods and atmospheres in the space of just a few minutes. "Voice Across the Water" is a cool cosmic prog-jazz-fusion track. "Gateway to the Seventh Dimension" and "Galaxy of Dreams" are among my favorite tracks and will put a smile on the face of prog fans. I love the spacey and hard rock elements and compositional twists and turns on "Gateway to the Seventh Dimension". Highly accessible yet varied and complex. And "Galaxy of Dreams" is an outstanding space-prog rocker, with killer heavy rock jam segments and some of the most mind-melting guitar work on the album. No review of this album would be complete without some ranting and raving about the packaging. The CD comes mini album style with a 32 page booklet packed with lyrics, beautiful fantasy and sci-fi artwork, and photos. The packaging possibilities of CDs are inherently limited, but Clear Blue Sky have pulled a stunner with this one. Really makes me pine away for the days of the gatefold LP. Outasight!!! For more information you can visit the Clear Blue Sky web site at: http://www.clearbluesky.co.uk. Hear music at the Clear Blue Sky Myspace page at: http://www.myspace.com/clearbluesky. Visit the Stone Island Records web site at: http://www.stoneislandrecords.com.